Ask fellow campers about "Bennett Spring State Park" and nearby attractions. Bennett Springs State Park is one of those hidden gems in the Ozarks. As a bonus there it's a trout park on top of that! We camp here every year, but you have to make reservations and make them EARLY! We make ours six months out just to make sure we have a spot. Section 1 is very spacious with E/W/S, which is rare for state parks. If you want things a little more rustic, then section 2-4 are for you. We camped at Bennett Spring State Park in a Fifth Wheel. Very nice park. Level concrete pads. We had privacy due to our November stay. My wife does not like unisex rest rooms or this would have been a 10 rating. We camped at Bennett Spring State Park in a Motorhome. Great state park. We stayed in Campground 1 with full hookups. There is no cable or WiFi and our antenna didn't pick up much but there's plenty to enjoy. Canoeing, fishing and hiking. The trout fisherman are every where and the spring water is so cold that they are all wearing waders. Sites are flat and wide. The park store rents fishing gear including waders so everyone can have a go at the trout. We camped at Bennett Spring State Park in a Travel Trailer. Bennett Spring State Park is a gem! Beautiful grounds and the park is very well kept and clean. Concrete pull-thru with a grassy area. Most pads seemed partially shaded. Trout fishing is a short walk away. We camped at Bennett Spring State Park in a Fifth Wheel. I don't know where to start with describing this park. It is beyond beautiful, with so much to do. There is a fish hatchery there, and they release trout certain times, and the streams are spring fed, crystal clear, and a lot of people fish there. They rent cabins, have a hotel, restaurant, HUGE store, sell fishing licenses, and tons of walking paths, fish hatchery tours, and just so much more. It is beyond pretty at ALL the sites as we drove around looking at the place. For such a large place, its kept very clean. We would LOVE to spend at least a week there in the future sometime. We camped at Bennett Spring State Park in a Tent Trailer. Wonderful state park, caters to trout fishing. Campsites in loops 2-5 are spacious. Decent wi-fi. Nice playground, pool, fish hatchery, restaurant, store. Canoe rentals available to float Niangua River, a popular activity. We have camped here many times. Reservations needed for weekends in summer, it fills quickly. $2 discount for over-65 senior campers. We camped at Bennett Spring State Park in a Travel Trailer. A first class Missouri State Park of which they can be very proud. We are not fisherman, but the trout fishing apparently is world class. The bottom campground can hold any size rig and has full hook ups. There is a VERY steep paved road up the hill to all the other campgrounds, which are not as level or open as the bottom area. I would never take a larger rig up that steep hill. I would estimate the grade close to 20%. Reservations, we hear, are a must, and we were lucky to get the last available site when we were there. Good cell reception. This was a gem and we are glad we got into see it. Some campgrounds shut down the water after October 15th for freezing prevention. We camped at Bennett Spring State Park in a Motorhome. Lots of trout fishing, with a hatchery on site, and stocked often. Good hiking as well. 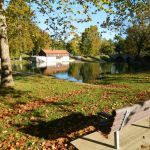 The park is about 11 miles west of Lebanon, Mo. Full hookup campground has level, paved, reasonably sized sites. Within a few yards of the trout stream that seems to be the main attraction. I'm not a fisherman but this is still a great place to visit. They have several campgrounds including the whole range of amenities from none to full hookups with wifi. The wifi isn't great but it's better than most campgrounds. We camped at Bennett Spring State Park in a Fifth Wheel. Don't let your GPS lead you north of route 64 alt. Coming from Lebanon you want to make a left turn from 64 onto 64 alt. The park entrance north of 64 alt takes you across a bridge you probably don't want to cross in an RV. Campground located in a state trout park. Very nice campground, well laid out and very maneuverable with a large rig. The lodge has nice restaurant that caters to the fishing crowd. 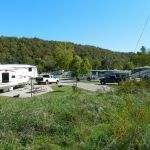 We camped at Bennett Spring State Park in a Fifth Wheel. Beautiful grounds and campsites. Quiet and secluded. We didn't fish but thoroughly enjoyed watching the many fly fishers and the touring the fish hatchery, which is on site. We camped at Bennett Spring State Park in a Motorhome. This is a wonderful place! We stayed here in the spring and fell in love with it. They ran out of sites before my sister could reserve one, so she ended up staying just down the road. They had limited hookup sites but were extremely awesome as well, and the sites were more secluded than the state park. All in all, we love Bennett Springs. The people are stupendous, the landscape is inspiring and the roads are surprisingly maneuverable for rv'ers. Beautiful. We camped at Bennett Spring State Park in a Motorhome. We camped in the full hookup campground and loved it. The pull-through was nice and level and the whole park is just beautiful. We don't trout fish, which is the big draw here, but spent three nights and truly enjoyed everything about this place. Full hookup sites must be reserved well in advance, it seems. We ate at The Lodge, which is the restaurant built by the CCC back in the 20s. Lovely place with very good food. We loved it here and will definitely come back. We camped at Bennett Spring State Park in a Motorhome. This campground is one of our favorites! It does get busy in the summer and we prefer staying early or late in the season to avoid the crowds. Trails are amazing. Worth the hike to the tunnel. Neatest little old cemetery tucked in a few miles in. One thing that turns me off is that there are usually gross fish guts in the water, wish people were more considerate about where they gut their fish. Would suggest avoiding the kids fish free weekend in May. Loop One, as people have mentioned, is totally flat and has full hookups, but sites are close, in full sun, little privacy. The sites up the hill are much better, heavily wooded, and well-spaced. Things do get a bit noisy, lots of activity. Restaurant is a plus. The newest shower house has individual rooms, which is nice with small children. There was a new shower house in another loop that had not yet opened when we were there. We camped at Bennett Spring State Park in a Motorhome. Too bad we are only staying here one night. This is an absolutely beautiful park and campground. We stayed in the full hookup CG near the entrance. The camp site was paved with concrete and pretty level. We could leave our toad hooked up since we had a pull through. The utilities were more than adequate. You will want to use a water pressure regulator here. The only thing that was a problem was the confusing signs directing us to the campground. Sorry we had no time to try out the trout fishing that brings most people here. We would certainly return here if we are ever in this area. We camped at Bennett Spring State Park in a Motorhome. Are you affiliated with Bennett Spring State Park ?